Following the Soviet invasion of Afghanistan in 1979, the Taliban emerged as a resistance movement aiming to eject the Soviet troops from Afghanistan. With the United States and Pakistan providing considerable financial and military support, the Afghan Mujahideen were able to inflict heavy losses on the Soviet troops. According to The New York Times, the Soviet Union lost about 15,000 soldiers in Afghanistan. In 1989, the Soviet troops withdrew from Afghanistan, and the Afghan Mujahideen, under the leadership of Ahmed Shah Massoud, surrounded the Afghan capital, Kabul, and took over the rule three years after the departure of the Soviets. The Afghan government that was backed by the Soviet Union and led by President Sayid Mohammed Najibullah was subsequently overthrown. The Mujahideen alliance forming the new Afghan government, led by Burhanuddin Rabbani as interim president, failed to reach political unity and ended up fighting one another (Matinuddin 12-16). VIDEO. The Taliban was one of the Mujahideen factions that formed during the Soviet occupation and the internal fighting in Afghanistan. The Taliban emerged as a powerful movement in late 1994 when Pakistan chose the Taliban to guard a convoy trying to open a trade route from Pakistan to Central Asia. With Pakistan providing weapons, military training, and financial support, the Taliban gained control over several Afghan cities and successfully captured Kabul in September 1996. The Taliban continued to control most of Afghan territories with intermittent fighting with Afghanistan’s Northern Alliance, led by Ahmed Shah Massoud, the former defense minister under the coalition government led by President Burhanuddin Rabbani (Maley 1-9). Pakistani support for the Taliban is based on strong religious and ethnic bonds between the Taliban and Pakistan, especially with the tribal areas on the North-West borders of Pakistan. Most of the Taliban’s leaders were educated in refugee camps in Pakistan where they had escaped the Soviet invasion. Taliban militants are Sunni Muslim Pashtuns, and Pashtuns constitute thirteen percent of the total population of Pakistan. Pashtuns dominate the Pakistani military and are concentrated in the North-West Frontier province, which was the command center for the Mujahedeen groups fighting the Soviet troops and a major destination for the Afghan refugees (Matinuddin 16). Following a public condemnation of the Saudi monarchy for allowing U.S. troops to enter and operate in Saudi Arabia, Osama Bin Laden moved to Sudan and eventually, in 1996, to Afghanistan, where he had fought against the Soviet troops and where he was warmly welcomed by the Taliban and its top leader, Mullah Mohammed Omar. As the Afghan Taliban had allowed Bin Laden to recruit militants and run training camps, the United Nations Security Council passed two resolutions UNSCR 1267 (1999) and 1333 (2000), asking the Taliban to cease its support for terrorism and hand over Bin Laden. The Taliban took no action to end Bin Laden’s training activities and recruitment of militants and displayed no positive response to the Security Council resolutions. After the bombings of the U.S. embassies in Kenya and Tanzania in 1998 and the attacks on the World Trade Center and the Pentagon in 2001, the United States asked the Taliban to turn over Bin Laden. The Taliban refused to hand over Bin Laden and ignored the U.S. demands, and the United States, in response, bombed Taliban’s strategic military sites in Afghanistan. Consequently, the Taliban lost control over the Afghan Capital, Kabul, and was completely routed in December 9, 2001 (Moreau). support for The U.S. efforts to capture Bin Laden and fight militant groups and all the Taliban members associated with Al Qaeda, a pledge that was followed by immediate demonstrations and protests by the pro-Taliban groups in Pakistan, where Taliban’s leaders were educated and where they fled the U.S. bombing of Afghanistan. Despite the pledge to fight Taliban and Al Qaeda, having such religious, ethnic, and political ties with Taliban, and being uncertain about an immediate severing of the momentum in the multifaceted and historical ties with the Taliban have pushed the Pakistani military and Musharraf's regime to avoid provocation of the Taliban fighters. Thus, the Taliban leaders, who survived the U.S. bombing of Afghanistan and the combat against the NATO troops in 2001, went back to Pakistan, precisely to the tribal areas where their Pashtun brothers reside, and namely to the North- West borders of Pakistan (Moreau). The United States moved to Iraq in 2003 and directed its military force on Iraq, and the Taliban, operating from southern Afghanistan and North-West Pakistan, namely Waziristan, started to regroup and carry out several deadly attacks against the U.S. led coalition in Afghanistan. The attacks against the U.S. troops continued to increase and the year 2006 was the deadliest year of fighting between the NATO troops and the Taliban since the 2001 war. Noticing the increasing attacks by the Taliban, NATO deployed about 40,000 troops in southern Afghanistan and launched a large operation against the Taliban militants operating in southern Afghanistan and along the borders with North-West Pakistan. Following the NATO operation, the Taliban lost its last stronghold on Afghan soil, and most of the Taliban fighters in Afghanistan were killed. Recognizing NATO strength and losing a large number of its fighters and more importantly its strategic base of command in southern Afghanistan, Taliban moved to Pakistan, specifically to Waziristan, where they were welcomed by their Pashtun brothers (Maley 38). In 2003, the Pakistani government had intervened to contain and counter the Taliban’s expansion and influence and deployed a total of 80,000 troops in South and North Waziristan. After several confrontations with the Taliban militants and the loss of eight hundred Pakistani soldiers in combat, the Pakistani government and President Pervez Mushrraf realized that military confrontation of Taliban could further destabilize the country. Accordingly, in September 2006, Musharraf signed a peace agreement with seven militant groups in Waziristan, who call themselves Pakistan Taliban or Tehrik-i-Taliban. Under the terms of the agreement, Pakistan's army agreed to withdraw from the areas controlled by the Taliban in Waziristan, and the Taliban promised to stop launching attacks against NATO and Afghan troops in Afghanistan and against Pakistani army and government (Gregory). Please, click to watch the VIDEO about the peace deals with the militants. The peace agreement with the Taliban fell apart when the Pakistani army intervened and laid siege to the Islamabad Red Mosque whose students and religious leaders had launched a campaign, accompanied by kidnappings and violence, to establish and impose Shariah Law in Islamabad. When negotiations between government officials and Mosque leaders failed, the Pakistani army attacked the mosque, leaving about one hundred people dead. The raid of the Red Mosque triggered a series of violent attacks against the Pakistani government because the Mosque and its leader, Maulana Abdul Aziz, have close religious ties with the Taliban. Both Maulana Abdul Aziz and Taliban want to establish Shariah Law in Pakistan. The Taliban cancelled its cease-fire agreement with Musharraf government in September 2006 and carried out several suicide bombings against government officials and security offices. The suicide attack against the regional office of the Pakistani Federal Investigation Agency in Lahore and the assassination attempt carried out against the former Interior Minister, Aftab Khan Sherpao, are the two major attacks that came after the Red Mosque incidence (Gregory). While the Taliban has rescinded the cease-fire agreement with Musharraf and carried out several deadly attacks against civilians and government officials, the power conflict between Mushrraf and opposition leaders, especially the former Pakistani Prime Ministers, Benazir Bhutto and Nawaz Sharif, has intensified. In September 2007, Musharraf and his government deported Sharif hours after his arrival in Islamabad although Pakistan’s Supreme Court ruled that Nawaz Sharif could return to Pakistan, Sharif was allowed to return to Pakistan until November 23, 2007. In March 2007, President Musharraf suspended Chief Justice Iftakar Mohammed Chaudhry, which led to demonstrations by supporters of Chaudhry and violent clashes with the Pakistani police. In May 2007, thirty nine people were killed in Karachi as a result of bloody clashes between supporters of Chaudhry and those supporting the government. 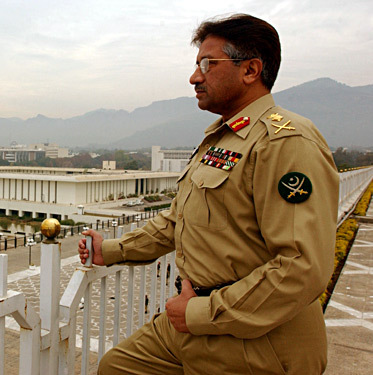 In November 2007, Musharraf declared a state of emergency and suspended Pakistan's constitution, and at least five hundred opposition members were arrested. Consequently, thousands of lawyers led demonstrations to protest the emergency rule, and about seven hundred lawyers were arrested by the police. Musharraf did not lift the state of emergency and restore the Constitution until December 14, 2007. Musharraf stepped down as army chief in November 28, 2007 and announced that the parliamentary elections would take place in January 2008. As the country seemed to be healing, Benazir Bhutto was killed in a suicide attack in December 2007 at a campaign rally in Rawalpindi. The killing of Benazir Bhutto triggered violent riots by her supporters, who accused the government of being involved in Benazir’s death (Hathaway). Maley, William. Fundamentalism Reborn: Afghanistan and the Taliban. New York: New York University Press, 1998. Matinuddin, Kamal. The Taliban Phenomenon. Karachi: Oxford University Press, 1999. Coll, Steve. “The Stand-off.” New Yorker 82.1 (2006): 126-139. Moreau, Ron. “Where the Jihad Lives Now” Newsweek 150.18 (2007): 26-34.